The harp is the only traditional instrument in Wales with an unbroken history up to the present day. It is also the instrument most often cited in Welsh literature through the ages. The earlier harp was a small instrument – ‘telyn benglin’ (penglin = lap). It was also referred to as the ‘telyn farddol’ or bardic harp – an instrument similar to others throughout Europe. An example of this type of harp can be seen in a wood carving from the early 15th century, on the bed frame of the nobleman Sir Rhys ap Thomas of Dinefwr. 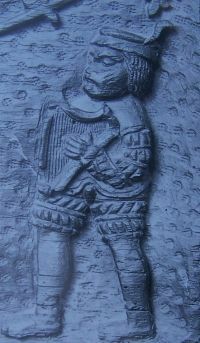 The carving shows a harp player as part of a military campaign. Twisted horse-hair was used to make the harp strings, and there are many references to the 'telyn rawn' (rhawn = horse-hair). In all likelihood, metal strings were also used, as in Ireland. It is thought that the Welsh harp was rather different from the Irish equivalent: with a straighter pillar and lighter in construction. On some harps, small L-shaped wooden pegs held the strings to the soundboard, touching the strings and causing them to ‘buzz’. These pegs were called gwarchïod. Harps in Wales were usually made from wood (for the framework and pegs), animal skin (for wrapping the soundboard), bone (for making the tuning pegs), and horse-hair for the strings. According to description in poetry, a harp would typically have around 30 strings. The Welsh harp was always played on the left shoulder. By the 14th century, the ‘telyn rawn’ or horse-hair-strung harp was losing ground to the ‘telyn ledr’ or leather-harp – a change bemoaned by the poets, as seen in a cywydd by Dafydd ap Gwilym. We don’t really know what sort of music the early harpists would have played. The manuscript of Robert ap Huw (c.1580-1665) is the only clue, and it's taken a long time to decipher! This manuscript is the oldest collection of music for the harp in the world today. Telynor y Waun Oer (Evan Jones) and the penillion singer Eos Mawddwy (Robert Evans) circa 1865. According to the dictionary of Sion Dafydd Rhys, there were five different modes of cerdd dant: Is-gywair, Cras-gywair, Lleddf-gywair, Go-gywair, and Bragod-gywair. A series of technical terms describing the hand movements has also survived, such as Tagiad y Fawd (thumb stop), Plethiad byr (short fold), Plethiad y pedwarbys (fourth finger fold), and so on. Over the centuries, patronage was central to the livelihood of the harpists – as it was for the bards and other singers. A special system existed whereby degrees were conferred on poets and musicians. They were placed in distinct categories so that they could be 'licenced'. These degrees determined how much they could earn on their ‘clera’ travels (performing for money). The old bardic degree system broke down from the Tudor period onwards and patronage by noblemen ebbed away as they became anglicised. Many Welsh harpists made a living in London, including some royal harpists. In Wales, the decline was gradual. For example, in 1594, in a single mansion on Anglesey, 13 harpists were listed over a period of only two months. In the 18th and 19th centuries, the harp makers of, for example Llanrwst, Llangynog and Cardiff (Bassett Jones) were very productive – a reflection of the popularity of the instrument in that period. The triple harp came to Britain during the reign of Charles I, around 1630. It is believed that the first ‘telyn deires’ or triple harp in Wales was made towards the end of the 17th century by Elis Sion Siamas of Llanfachreth near Dolgellau. The triple harp has a range of five octaves and about 95 strings in three rows. The two outer rows are diatonically tuned in unison, whilst the middle row is tuned to the chromatic notes. The triple harp became popular first of all amongst the Welsh harpists in London. Over the years, its popularity in Wales itself grew so much that it came to be known as the ‘The Welsh Harp’. Dozens of these instruments were made during the 18th and 19th centuries. The triple harp probably took hold in North Wales initially, but before long it spread to the south, thanks to the enthusiastic support of individuals such as Lady Llanofer, Augusta Hall (1802-1896). 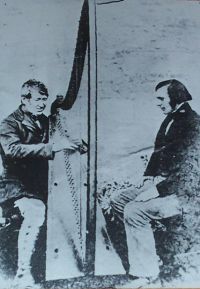 During the 18th century, players such as John Parry, the blind harpist from Rhiwabon, came to be known as one of the best harpists of his time, and in the next century ‘Telynor Cymru’ (The Welsh Harpist), John Roberts of Newtown – descended from the Wood gypsy family – was also responsible for spreading the popularity of the instrument. "I have now reluctantly arrived at the conviction that it would be nothing less than downright cruelty to handicap our compatriots by offering any further encouragement for the study of an instrument which would keep them so far behind in the race of progress and distinction." In the 20th century, the triple harp was almost completely ousted by the pedal harp, and musical emphasis moved from traditional to classical. But the tradition was kept alive by Nansi Richards, Telynores Maldwyn (the Montomeryshire Harpist), who was trained in the traditional style by Telynor Ceiriog at the beginning of the 20th century. 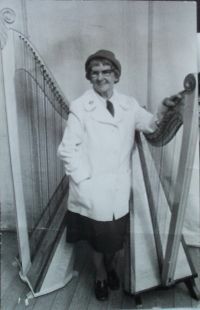 Despite the fact that only a handful of players still played the triple harp when she died in 1979, through her vibrant personality and enthusiasm, her influence was widely felt and she passed on her skills to people such as Dafydd and Gwyndaf Roberts (Ar Log) and Llio Rhydderch. The two most prominent leaders of the recent revival are Llio Rhydderch and Robin Huw Bowen. 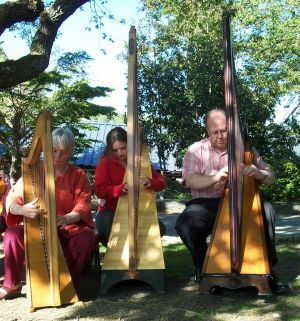 Between them, they have put the old triple harp back on its feet in its own right, rather than in the shadow of other kinds of harps, and have highlighted the instrument's unique technique and sound.